I've been considering the 1881 census as a source for studying the naming habits of the Victorians. Due to the nature of the source - a snapshot of the names and location of the inhabitants of Britain over a certain day, then it isn't very useful for the kind of name popularity progression that I have mapped using the Birth record data. Though it can show which names are popular in certain sections of the population, it is skewed in that not everyone born will be present on that day in 1881. The average life expectancy in Victorian Britain was around 40 - meaning that anyone born before 1841 was over life expectancy. Child death- though not every child birth may have been recorded- still means that children born only a few years before could fail to appear on the record. The line on the census records graph shows where the birth records graph begins. 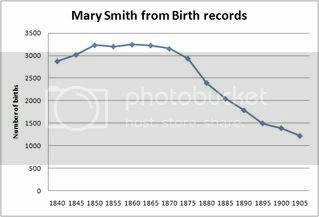 As can be seen here, the census records graph suggest that Mary started declining in the 1850s, whereas the birth record graph suggests that the major decline only began in the 1870s. 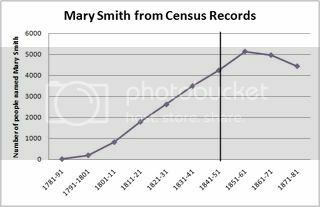 Prior to 1850s, there is a steady increase in the numbers of Marys, possibly caused by the decrease in population as you get towards 1791, rather than the increase in popularity of Mary. However, the line graph is useful for showing the trajectory of new names, rather than ones that have had sustained popularity. My favourite for the Victorian period always has to be Florence. In order to work out the popularity of a name using census data, then perhaps it is necessary to look at the proportions of names used - say (and these are not actual figures) 6.7% of women born between 1785-90 were called Mary, whereas from 1850-55 only 3.4% had that name. This is a line of inquiry that possibly needs to be pursued further. 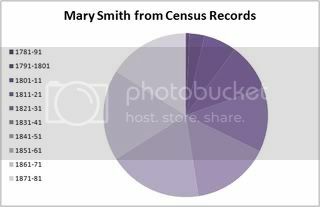 Though all the purple is making my eyes go slightly fuzzy, it does show a decent progression from 1791-1881 rather than random colours, and shows that most Marys were born 1831-81, and that though there was a decline, the proportions were all still fairly similar (though of course, this does not take into account the fact that if you were born in 1851, you had 30 more years to die in than if you were born in 1880). Another method would be to rank all the names from popular to least popular. Thankfully, D. Kenneth Tucker has already done that. 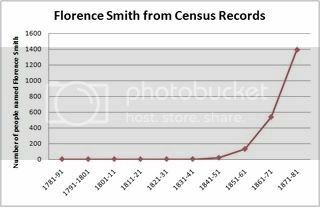 Censuses for UK are available 1841-1901 so far (and 1911 should be widely available next year, though it is searchable) so could be used instead of birth records for charting the popularity of names over a 50 year period. Indeed, as it runs for the same period as birth records, then the two could be compared - perhaps removing the room for error by only looking at the decade preceding when a census was taken. The 1841/51 censuses are valuable tools for looking at the popular names of the late 18th century, that are not recorded in birth records.